Exploring Southeast Alaska on a Lindblad-National Geographic expedition is an unrivaled experience, and your guarantee of an in-depth encounter with all the wonders Alaska has to offer. Expand the Overview to the right to read about all we’ll do, see, and learn. Brown bears. Humpback whales. Orcas. Steller sea lions. Bald eagles. Sure-footed mountain goats on steep cliffs. The wildlife of Alaska is legendary — see it in abundance. Along with the educational and group travel expertise brought by your faculty leaders, Ted and Michelle Johnson (see below for more info), you’ll explore under the sure guidance of an expedition leader, five veteran naturalists, including a Lindblad-National Geographic certified photo instructor and an undersea specialist, plus a wellness specialist — the largest and most knowledgeable expedition team in Alaska. Their knowledge and passion for Alaska is the key to your once-in-a-lifetime experience. Click on the map to see a more detailed itinerary. 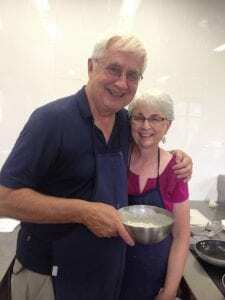 Ted Johnson, professor emeritus of biology, and Michelle Johnson, retired St. Olaf Health Center medical technologist, are veteran travelers and program leaders. Ted and Michelle led the St. Olaf Global Semester in 1998, the Environmental Studies in Australia Semester in 2004 and Term in Asia in 2006 and 2012. Ted led students on an Interim study service program in Peru multiple times. Ted graduated from Augsburg College in 1968 and received an MS and a PhD from the University of Illinois in 1973. He was with the biology department at St. Olaf for 38 years, teaching primarily courses in microbiology and immunology. He has been chair of the Health Professions Committee and has served as an advisor for many students interested in a career in the health professions. Michelle graduated from Millikin University in 1969 and received a masters in English from Mankato State University. Ted and Michelle have three children. Expect every day to be an adventure. You’ll explore on foot, by kayak, and by zodiac-type landing craft. To participate in this program you must be capable of traveling on board a 152-foot ship for several days at a time, climbing in and out of zodiac-style landing craft, hiking over uneven terrain, dealing with the emotional highs and lows that can occur when traveling, handling your own luggage, and traveling with a group for several hours each day. You always have the option of skipping a group activity you think will be too strenuous and remaining on the ship. You are responsible for reviewing the specific requirements for this program and judging the appropriateness of these travel activities to your physical, mental and behavioral capabilities. Any participant who is unable to fulfill the program requirements may have their registration cancelled. Any participant who has demonstrated an inability, in the opinion of the program leader, of keeping up with the group or of safely participating in program activities may be prohibited from participating in certain activities or excused from the program. The atmosphere on board is casual. There is no expectation of any formal dress whatsoever; after all, it is an expedition. Clothing that can be layered is the most suitable to provide maximum versatility to your wardrobe. Packing recommendations will be provided prior to departure. You can check average weather information and, closer to departure, actual forecasts at weather.com or wherever you get your forecasts. You should plan on seeing your family physician or a travel doctor at least four to six weeks prior to departure, preferably earlier, to talk about routine vaccinations. For more information on travel health, visit cdc.gov or who.int. The program fee varies by cabin (see below) and includes discussions led by Ted Johnson, assistance by Michelle Johnson, services of an Expedition Leader, naturalist staff and expert guides, accommodations, all meals and non-alcoholic beverages on board, 24-hour coffee, tea & soda, hors d’oeuvres and snacks during daily recap, excursions and special access permits, use of kayaks, airport transfers if you fly on the recommended group flights, all port charges and service taxes. Unlike most St. Olaf Travel programs, gratuities are not included (see below for exclusions). Participants are solely responsible for all expenses not specifically included in the program fee. Examples of excluded expenses are: All airfare • Airport transfers, unless you book the recommended flights • Any passport, visa, or immigration fees • Any recommended immunizations or vaccinations • Baggage insurance • Trip cancellation insurance above $2,000 lifetime coverage • Alcoholic beverages • Spa treatments • Internet or phone charges • Gratuities. CATEGORY 1: Main Deck #301-306 — Cabins feature two lower single beds that can convert to a Queen, a writing desk, and two portholes. CATEGORY 2: Main Deck #307-315 — Cabins feature two lower single beds that can convert to a Queen, a writing desk, and two portholes. CATEGORY 3: Upper Deck #201-206 — Cabins feature two lower single beds that can convert to a Queen, a writing desk, and two large view windows. CATEGORY 4: Upper Deck #207-229 — Cabins feature two lower single beds that can convert to a Queen, a writing desk, large view window, and small, private balcony. CATEGORY 5 (SUITE): Observation Deck #101-108 — Cabins feature two lower single beds that can convert to a Queen, large view windows, an expanded bathroom, writing desk, ample storage space, and a convertible sofa bed to accommodate a third person. NOTE: Sole Occupancy cabins are available in Categories 1 and 2 only. Third person rates are available in Category 5 cabins at one half the double occupancy rate. See the deck plan and more information about the Quest. Familiarize yourself with a variety of Resources, including How to Be an Independent Traveler, safety overview, general health information, and more. Do not book your flights until we can confirm the program is a go. Do block the dates of August 17-24, 2019. We will post more information here when it is safe to make your flight reservations. Registration is now closed. Please head back to the map to check out all our other destinations!